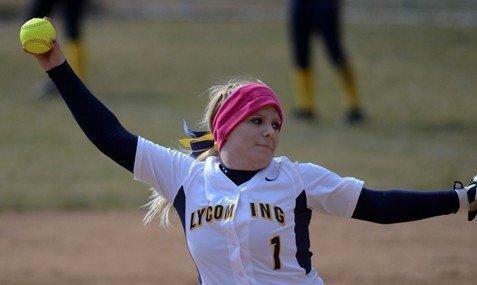 WILLIAMSPORT — Senior Holly Lansberry (Curwensville) pitched her way into the Lycoming history book again at the Shangraw Athletic Complex April 16 with the program’s first seven-inning perfect game that was rewarded with her second Commonwealth Conference Pitcher of the Week honor of the season. The 5-2 right-hander struck out 12 of the 21 Keystone batters she faced in the 3-0 win, including eight in a row from the first through the third innings. The perfecto is the fourth for the Warriors, the other three being five-inning games. Morgan Mantle (2005) and Kristen Reese (2006) also recorded theirs against Keystone, while Brie Braga and Caroline Lapano combined for one against Principia last year. Lansberry, who also was named Warrior of the Week for the fourth time in her career, closed the week with a 5-2 complete-game victory against Stevenson Sunday, allowing eight hits, all in the first four innings, while striking out two and walking none. She also pitched a complete game in a nine-inning, 5-4 loss at Elizabethtown Saturday. She gave up eight hits and two earned runs, striking out one and walking three. In 22-1/3 innings, Lansberry had a 1.57 earned run average with 15 strikeouts and only three walks that, combined with a 5-for-15 at the plate with one double and .600 on-base average as the leadoff batter, earned her a fourth Warrior of the Week Award. She walked eight times and was hit by a pitch twice. The Warriors split six games during the week for a 14-18 record. They are 3-13 in the conference. For the season, Lansberry is 7-6 with a 2.51 ERA in 17 appearances. She has completed 11 of her 14 starts and allowed 87 hits and 44 runs, 32 earned, in 89 innings. She has racked up 80 strikeouts and walked 22. Lansberry is second on the team in hitting with a .295 (26-for-88) average, three doubles and four runs batted in. She has drawn 11 walks. UNIVERSITY PARK — Senior Scott Rosenthal (Clearfield) punctuated his outstanding career as a still rings specialist for Penn State by earning All-American status for the third year in a row in front of a home crowd of more than 1,500 fans who entered Rec Hall for the NCAA Championships individual finals Sunday afternoon. Rosenthal, who was unable to compete until mid-February because of a shoulder injury, earned a season-high 15.400 score to place third in just his sixth event of the year. Rosenthal posted a 15.250, second highest for the Nittany Lions and fifth overall, to help Penn State win its team qualifying round Friday, besting five other squads with a 436.900 aggregate total. He improved to 15.350 Saturday when the Nittany Lions, ranked No. 1 in the nation most of the season, placed fourth with a 436.100 score in the six-team finals. His score was No. 3 for Penn State and tied for No. 8 overall. Rosenthal, who finished behind Oklahoma’s Michael Squires (15.775) and William & Mary’s Landon Funiciello (15.675) in the individual finals, claimed his previous All-American laurels by placing eighth with a 15.000 as a sophomore and second with a 15.250 as a junior. During his four-year career, Rosenthal won 21 titles and shared another. He won the Big Ten Conference championship last year after placing second as a sophomore. Rosenthal departs as the Penn State record-holder, posting a 16.300 twice in 2012 to break his own standard of 15.900 set in 2011. Freshman Trevor Howard became Penn State’s first floor exercise national champion since 1963 with a 15.800 routine. Four other Nittany Lions also earned All-American honors, sophomore Matthew Felleman (14.850) fourth on the high bar, junior Adrian Evans (14.675) fifth on the pommel horse, senior Felix Aronovich (14.725) fifth on the high bar and senior Parker Raque (15.075) fifth on the still rings. ERIE — Junior closer Chad Zurat (Clearfield) earned his fourth save of the season in a 3-0 win over LaRoche Thursday that kept Penn State Behrend two games ahead of the Redhawks in the Allegheny Mountain Collegiate Conference title chase. Zurat gave up one hit, struck out three and hit one Redhawk in 1-2/3 innings while protecting the lead for Ryan Jacobs, who surrendered three hits in 5-1/2 innings four days after pitching the first perfect game in program history for a 1-0 win over Mount Aloysius. Zurat also got the call in the sixth inning of the 6-3 nightcap loss and retired four batters in a row. In his last six appearances, the hard-throwing right-hander has surrendered only four hits and no runs in 9-2/3 innings, lowering his earned run average from 7.11 following his roughest outing in three seasons to 2.81. He has whiffed 14 and walked three during that run. Zurat (2-1) has worked 16 innings with 21 strikeouts and six walks in 10 appearances. He’s given up 12 hits and seven runs, the five earned runs in one game. Lion senior Mike Moyer (Clearfield) made his fourth start against D’Youville on Wednesday and wound up with a no decision, departing after striking out three, walking three and allowing two hits and one earned run in 2-1/3 innings. The Lions, who won 7-1 after beating D’Youville 5-0 in the opener, are 20-8 with an 11-1 start in the AMCC. LaRoche is 7-1. Moyer still owns an outstanding 1.77 ERA . BRADFORD — Junior outfielder Sam Gardner (Curwensville) had four hits, drove in two runs and scored five as Pitt-Bradford (10-14) remained in the Allegheny Mountain Collegiate Conference playoff hunt with three wins in a trio of road doubleheaders last week. He was one of the big guns in the Panthers’ 28-3 rout of Hilbert on April 16 with two doubles and a single, two RBIs, one walk and three runs scored. Derek Smith led a 13-hit attack with two home runs, one a grand slam, and 10 RBIs. The Panthers, aided by 11 walks and nine hit batsmen, set a school record for runs and followed that up with a 10-7 win for a sweep; then dropped 3-2 and 5-0 decisions to LaRoche at Pittsburgh Saturday and then split with Mount Aloysius at Cresson Sunday, winning 7-4 after losing 2-1. Pitt-Bradford holds down fifth place in the AMCC at 6-6. Gardner has started 15 of the 18 games in which he has appeared and is 12-for-45, a .267 average, with four doubles and three RBIs. CLARION — Sophomore infielder Derek Danver (Clearfield) had one hit and was hit by a pitch twice in a dozen trips to the plate last week for the struggling Clarion (1-31) team that has lost 16 games in a row, nine by shutouts. Sophomore utilityman Brett Sutika (Grampian/Curwensville Area H.S.) drew a walk as a pinch-hitter in his lone at-bat. The Golden Eagles were handled by Point Park 7-0 and 9-1 in their first home games of the season April 16 and then were blanked 7-0 and 4-0 by Mercyhurst pitchers in a Pennsylvania State Athletic Conference twinbill at Erie Saturday as their team batting average dipped to .197. Danver is hitting .190 (12-for-63) in 25 games, all but one as a starter. He has two doubles and Clarion’s only home run. His six runs are tied for the team lead. And he has been hit a team-high six times. Sutika’s average is .143 (5-for-35), and he has one double and two RBIs. LEWISBURG — Penn State junior Gwenn Porter (Clearfield) crossed the finish line in 4:52.80 to claim eighth place among the 17 runners in the 1,500-meter race at the Bucknell Team Challenge in Christy Mathewson-Memorial Stadium Stadium. Lady Lion Gabrielle Cocco won the event in 4:36.70.